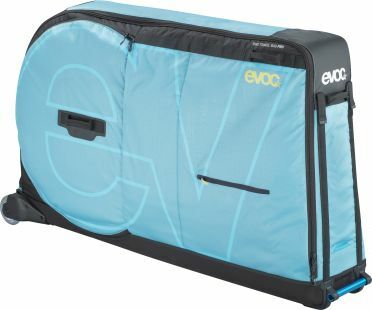 For many years the Evoc Bike travel bag pro bike case blue is the approved solution for transporting almost any type of bike around the world. As a hybrid construction it combines the advantages of a hard shell case with the properties of a soft bag. 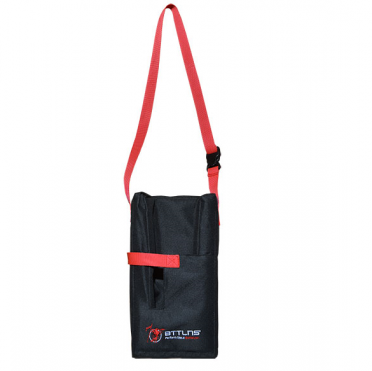 This Pro version of the bike travel bag has a sturdy iron handle on the front on which an extra wheel can be mounted so that it is easy to carry the bag without having to lift it. In addition to this extra wheel, the bike travel bag pro comes with a bicycle stand, a front fork adapter and a frame pad that protects your bike during travel. 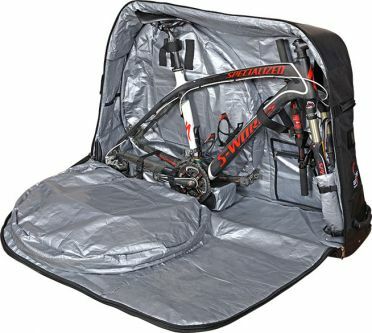 The bag is made so that almost every type of bike can be safely packed within a few minutes, once the handlebar, the pedals and the wheels have been disassembled, your bike fits effortlessly into the bag. The impact-protected undercarriage with the smoothly running, soft skate wheels ensures a safe transport and prevents tilting. 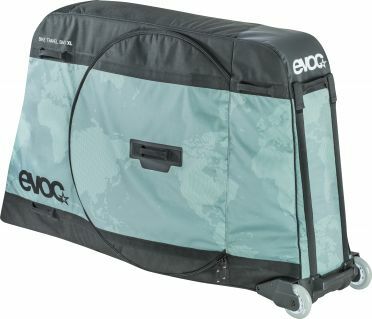 For many years the Evoc Bike travel bag pro bike case black is the approved solution for transporting almost any type of bike around the world. As a hybrid construction it combines the advantages of a hard shell case with the properties of a soft bag. 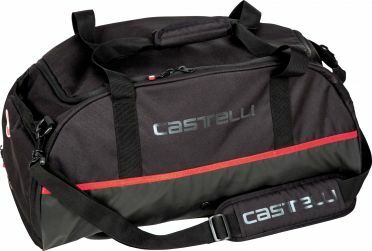 This Pro version of the bike travel bag has a sturdy iron handle on the front on which an extra wheel can be mounted so that it is easy to carry the bag without having to lift it. In addition to this extra wheel, the bike travel bag pro comes with a bicycle stand, a front fork adapter and a frame pad that protects your bike during travel. 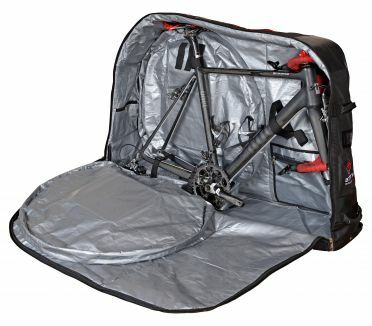 The bag is made so that almost every type of bike can be safely packed within a few minutes, once the handlebar, the pedals and the wheels have been disassembled, your bike fits effortlessly into the bag. The impact-protected undercarriage with the smoothly running, soft skate wheels ensures a safe transport and prevents tilting. 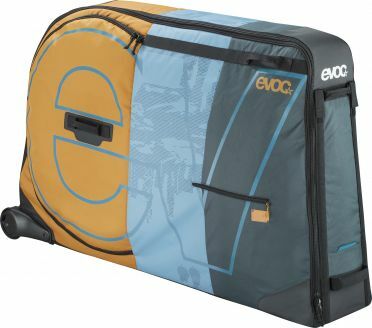 For many years the Evoc Bike travel bag bike case multicolour is the approved solution for transporting almost any type of bike around the world. As a hybrid construction it combines the advantages of a hard shell case with the properties of a soft bag. 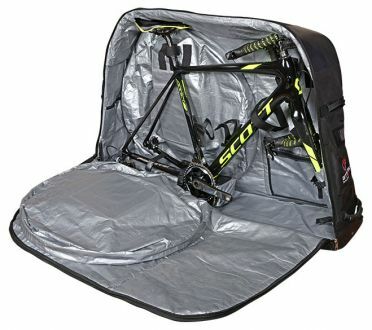 Despite the compact size of the bag, almost every type of bicycle can be easily packed within a few minutes to be ready for transport. Once the steering wheel, the pedals and the wheels have been disassembled, the bike and the parts fit effortlessly into the bag. The impact-protected undercarriage with the smoothly running, soft skate wheels ensures a safe transport and prevents tilting. 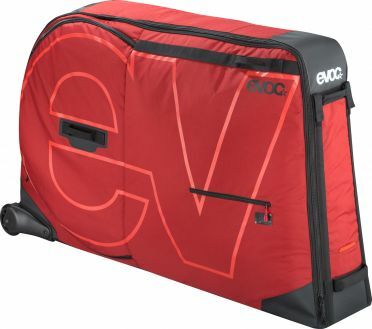 For many years the Evoc Bike travel bag bike case chili red is the approved solution for transporting almost any type of bike around the world. As a hybrid construction it combines the advantages of a hard shell case with the properties of a soft bag. Despite the compact size of the bag, almost every type of bicycle can be easily packed within a few minutes to be ready for transport. Once the steering wheel, the pedals and the wheels have been disassembled, the bike and the parts fit effortlessly into the bag. The impact-protected undercarriage with the smoothly running, soft skate wheels ensures a safe transport and prevents tilting. 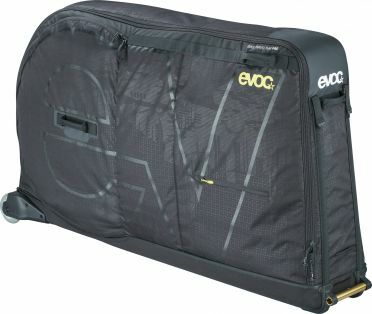 For many years the Evoc Bike travel bag bike case black is the approved solution for transporting almost any type of bike around the world. As a hybrid construction it combines the advantages of a hard shell case with the properties of a soft bag. Despite the compact size of the bag, almost every type of bicycle can be easily packed within a few minutes to be ready for transport. Once the steering wheel, the pedals and the wheels have been disassembled, the bike and the parts fit effortlessly into the bag. The impact-protected undercarriage with the smoothly running, soft skate wheels ensures a safe transport and prevents tilting. 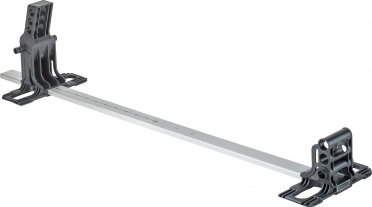 The Evoc Road bike aluminium stand is the perfect solution when it comes to fastening your triathlon/road/race bike in the bike travel bag (pro). 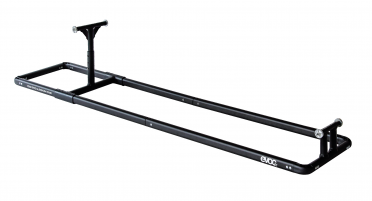 Multifunctional Evoc Bike stand for transporting your bike in the bike travel bag (pro). 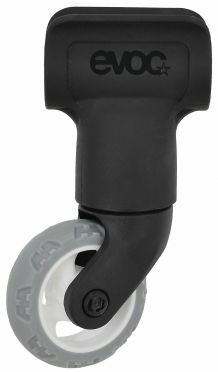 Various mounting options enable the fastening of different bicycle types and bike sizes. Necessary Evoc Bike adapter disc for packing of roadbikes into Bike travel bag. Perfect Evoc Bike travel bag XL 320 liter olive if more space is needed. 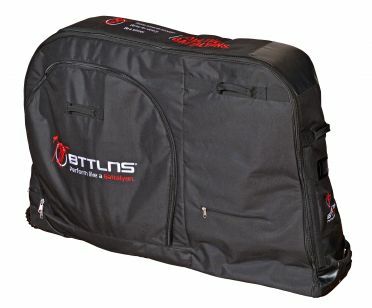 The travel bag XL for Plus- and Fat Bikes is the mobile alternative for storage to a bike box with maximum protection for frame, wheels and other components - whether for bike shipping or flying.